No barbeque, no picnics, no fireworks. My daughter had to work a double shift at the restaurant; the jelly fish have already invaded our beaches (usually not here til late July); and with fireworks at home being banned this year due to drought, we knew the Downtown Sertoma Fireworks display would be crazy busy, so we opted for a day at the pool for our Fourth of July celebrating. 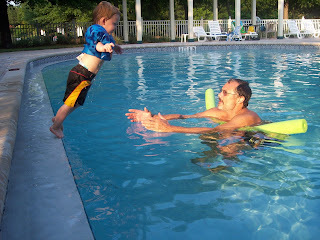 We wore Tyler out by 2:30 and he took an almost 4 hour nap, then we went back to the pool. Then WE were worn out. It was so totally worth it. What a great day we had with my mom at her community pool. Thanks, Mom! I found time to finish my Island Chain quilt top! I took Kim Brackett's class in May this year. It was great to meet her in person and spend the day with my aunt, who was visiting from Pacific Grove, CA. The back of this quilt will be Carrot Orange solid from Connecting Threads fabrics with the leftover jelly roll pieces scrapped in horizontally. 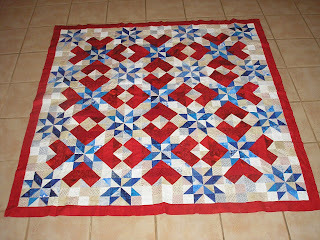 Sort of like this one from American Patchwork and Quilting. I like using up the leftovers from a jelly roll. Don't you? My daughter bought me this "Oh My!" jelly roll for Mother's Day this year, and I think this is the shortest amount of time it has taken me to open and use one! I know I could use the leftovers for a scrappy binding, but this quilt is pretty busy looking already. I am going to tame it with the solid orange for binding. Also (nearly) finished top from this weekend: "American Sweetheart" from McCall's June 2006 magazine! I started it at least 4 years ago and boxed it up when it was nearly done! I need to find the perfect outer border fabric for this and it can be quilted and delivered to the new owner! I must have boxed it when the 4th of July came and went, then I forgot about it. After piecing the last few blocks and spending a day putting the rows together, it is off my UFO list! 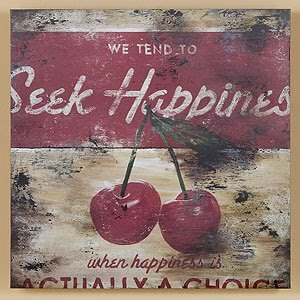 I hope you and yours had a wonderful 3 day weekend! The quilts look great! What do you think? A blue outer border for the "American Sweetheart"? We went to the beach for fireworks, and you're right - it was crazy! 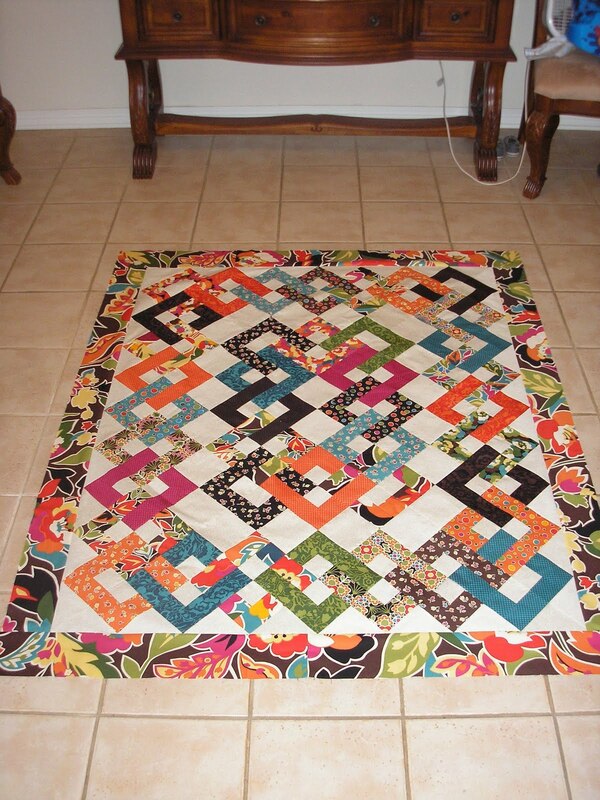 I love the way your Island Chain quilt turned out, and the border is SO COOL! 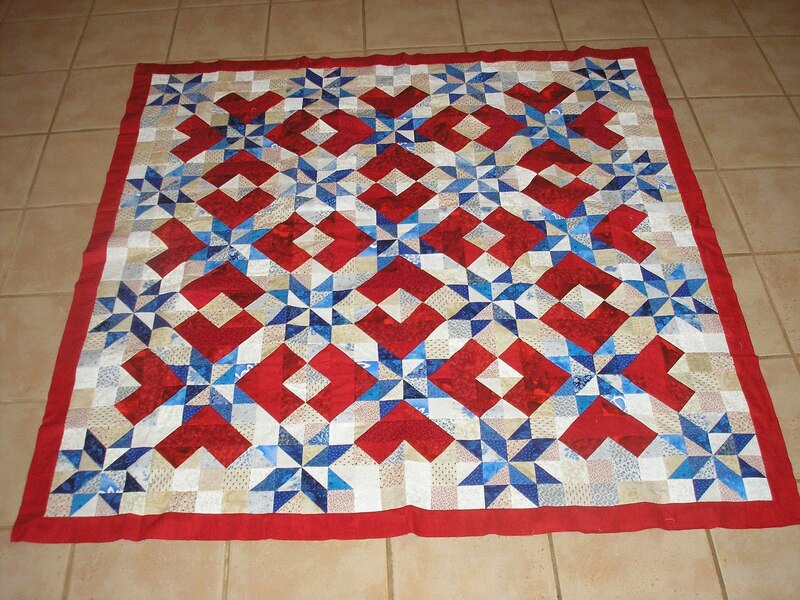 And the American Sweetheart quilt is fabulous. Congratulations on crossing one off the list!